2012 World Bank International Essay Competition – Not happening? This is bad news for writing enthusiasts around the world. In a message posted via Facebook last Janaury 17, Ms Catherine Doody, Communications Associate for World Bank (WB), announced that the annual World Bank International Essay Competition “has been put on hold for the time being.” She made the post on the same date the annual competition was launched a year ago. Launched in 2004, this annual global competition aims “to provide an opportunity for youth around the world to share their ideas on critical development issues.” Participants must be between 18 to 25 years old. 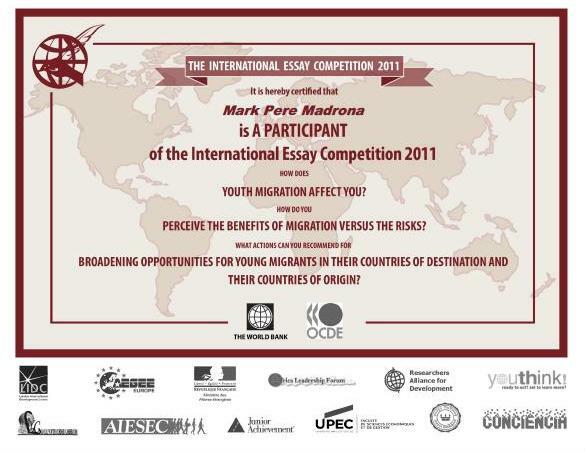 Youth migration was the theme last 2011. The competition got more than 2,000 entries, written in English, French and Spanish. The WB noted that 95% of the participants came from developing countries. MANILA, Philippines (2nd UPDATE) – At least 43 people died in Negros Oriental following a 6.9 magnitude earthquake that hit the province Monday, an Army official said. Twenty-nine died in a landslide in Moog, Barangay Planas in Guihulngan City, and 10 other died in other parts of the city, according to Col. Francisco Patrimonio, commander of the Army’s 302nd Brigade. He said they are still trying to determine the exact number of people injured by the quake and landslide. Two people died in Tayasan town, one was killed in Bindoy, and another one died in Jimalalod, all in Negros Oriental, Patrimonio said. He said looting is now rampant in Guihulngan City, forcing the military to enforce tougher security in the quake-hit city. Negros Oriental Gov. Roel de Gamo, meanwhile, said their own count shows 13 people confirmed dead in the province. He added that 40 are reportedly missing in Barangay Planas alone. Benito Ramos, National Disaster Risk Reduction and Management Council (NDRRMC) executive director, told ANC that they are still trying to verify the reports on the missing people. “Mayroon mga missing, hindi ito confirmed. Mayroon report doon sa mga malalayong lugar na mayroon nag-landslide,” he said. “Dalawang lugar po ito. La Libertad at Guihulngan,” he said. Night has fallen, causing problems for search and rescue workers sent to area. “Doon sa mga landslide area, walang ilaw doon. Kaya kailangan, flashlight-an ito ng Army truck, para iyung heavy equipment, mailawan,” Ramos said. He said local governments are coordinating with military and police for search and rescue operations. He added that evacuation centers have been set up in the 2 areas. “Iyung Army natin is conducting search and rescue operations sa Guihulngan and papasok yun dun pa sa La Libertad, via Navy na lang kasi na-isolate iyun,” Patrimonio said. Patrimonio said he has no report yet on the latest situation in Barangay Planas. He said some of people killed in the other parts of the province died after being buried by walls and a building that collapsed. The quake also damaged bridges in the province, according to Patrimonio. Only light vehicles can now pass the Matilo bridge in La Libertad, the Ayungon bridge and Dayoyo bridge in Jimalalod. Meanwhile, strong aftershocks struck Negros Oriental and parts of the Visayas on Monday. The strongest aftershock, which registered 6.2 on the readings of the United States Geological Survey, hit at 6:10 p.m. in an area 60 kilometers north-northest of Dumaguete City. The Philippine Institute of Volcanology and Seismology (Phivolcs) confirmed the initial report of the aftershock and warned the public to be on guard for more tremors. “Ine-expect natin na magko-continue iyun experience ng aftershocks for more than a week,” Phivolcs deputy director Bart Bautista told ANC. “Aabot pa ng mga 2 weeks. Maya-maya, yayanig,” he said. “Maiksi yan kumpara sa na-experience sa Japan. Sa Japan, hanggang nayon, nakaka-experience sila ng aftershocks,” he added. Phivolcs has recorded 157 aftershocks in the area, as of Monday night. Fifty of the 157 aftershocks were felt mostly in Negros Oriental, the agency said.